Review by AllTheBestFights.com: 2016-06-03, one sided fight between Ronny Rios and Efrain Esquivias: it gets two stars. Ronny Rios entered this fight with a pro boxing record of 25-1-0 (10 knockouts) and he is ranked as the No.20 featherweight in the world. He suffered his only loss when he faced Robinson Castellanos in 2014 (=Rios vs Castellanos), after this bout he has beat Sergio Frias (=Rios vs Frias) and Jayson Velez (=Velez vs Rios). His opponent, Efrain Esquivias, has a record of 17-4-1 (10 knockouts) but he is not ranked as he hasn’t fought since May 29, 2015 when he was defeated by Jose Haro; before this bout he had also lost to Ruben Tamayo. 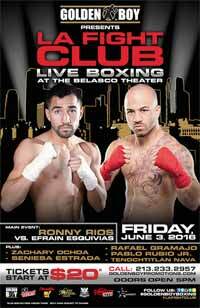 Rios vs Esquivias is the main event of the evening. Watch the video and rate this fight! Review: 2013-09-07, good fight with some nice and tough exchanges in the second part of the bout: Rafael Marquez vs Efrain Esquivias gets three stars. Rafael Marquez (41-8-0, 37 KOs=90%) entered as the No.21 featherweight in the world while Efrain Esquivias (16-2-1, 9 KOs) entered as the No.78 super bantamweight. Marquez vs Esquivias is on the undercard of Seth Mitchell vs Chris Arreola. Watch the video! Review: 2012-09-21, good pace and great exchanges between Efrain Esquivias and Jhonatan Romero: three stars. Efrain Esquivias (16-1-0) entered as the No.44 super bantamweight in the world while the undefeated Jhonatan Romero (21-0-0) entered as the No.49. Esquivias vs Romero, IBF super bantamweight eliminator. Watch the video!